"Buy Local" - we've seen that almost everywhere, from television ads to Main Street shop windows. But does it really make a difference? You bet it does! Whether you believe a rising tide floats all boats or you just want to "go Galt" with everything, "Buy Local" is much more than a philosophy, it's about the financial well-being of your entire area - and not just an approach to faster service calls. Getting to know your community better and having a vested interest in what happens to your business neighbors could be the most important step you take in not only protecting your own business, but getting it to grow. Promoting local business fosters an attitude of collaboration instead of hit and run sales from fly by night shop fronts or outside consulting firms. It promotes community engagement and becomes a driving force behind whether or not your area can either withstand economic downturns or can, in a word, thrive. 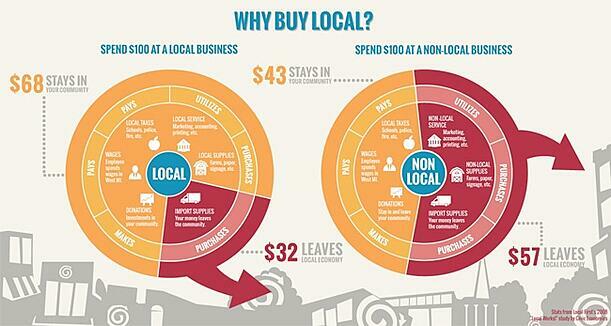 Often, when we think about the whole "Buy Local" proposition. most of us, myself included, also think "more expensive." But in my mind I am balancing local or artisan goods versus what I can purchase at the big box store across town. I want more for my money, more purchasing power, and then suddenly I'm coming home with 1,400 paper plates I didn't need in the first place! There has to be a better way. And as it turns out, there is. Buying from local merchants increases the overall health of the local economy. Now I'm not saying go ahead and spend more at the individually owned shops downtown because you'll feel better, but make making conscientious decisions about where to spend can do a great deal of good that comes back to help you as well. Now that's real purchasing power - actually having an effect on the economy that you can decide on and you control. Now let's move away from Main Street U.S.A. for a minute and out of the old Mom and Pop country stores to talk about business to business and the boosting of your local economy in order to better your own bottom line. How much time do you spend investigating business services and solutions you purchase in order to make your own stronger? What drives local economies and can make a real difference in whether your local business district hums with activity or slowly becomes a ghost town? You do. By taking on locally owned and staffed business services you are inserting money that flows into your friend's and neighbor's wallets, which then in turn flows into your business from purchased goods or whatever it is you sell. There's absolutely no reason to spend more money than you would have otherwise and you absolutely do not have to accept less in customer service. This isn't one of those long-term economic investments that's more ethereal and never able to chart on a graph either. You have a direct impact on the flow of money around you and what that money does, or better yet, where that money goes. Now not all products are made locally, I get that. Some are made out of town, out of county, maybe out of state or even out of the country. In those cases, buying local gives businesses better opportunities to decide on carrying more local products - and there is a local resource everyone has access to, and that's people. Buying local means more jobs, and better wages. More in fact than what is generally employed by outside "clone" businesses. The lifeblood of any local economy is money, and like blood it needs to keep moving around the local community for it to survive. When money for goods and services is spent at on-line retailers or places like non-locally owned supermarkets - "it flows out like a wound," says NEF¹ researcher David Boyle. This can lead to that "ghost town" effect or the new and yet just as invasive problem of "clone towns," where each town starts to look the same with the same fast-food restaurants and the same large retailers that move in to take over. Where does the money you spend at these national chains go? Out. It's that simple. And more jobs with better wages and benefits come from locally owned businesses than the cookie cutter business model that is brought in to compete for your dollars. The same goes for the business supplies and services that you choose to purchase. Working with other locally owned companies for business solutions and necessities like computers, printers, network connectivity, marketing, and financial banking or accounting, creates a sense of partnership, while at the same time you're generating an even bigger influx of dollars. Stacy Mitchell put this list together for the Institute and expanded on each point detailing the local and long term economic gains to be felt from buying local. According to Stacy, "communities that preserve their one-of-a-kind businesses and distinctive character have an economic advantage." Business and social relationships flourish and bonds are formed that link neighbors together to contribute to a stronger and more financially secure community. Decisions made by local business leaders have a direct impact on important factors such as jobs, quality of wages and benefits, local habitats, pollution, and whether or not you will have access to a broader range of products. Community outreach programs gain strength and there is a greater contribution to local causes. Greater freedom of choice and local enrichment increases across the board. Small town innovation fuels local prosperity propelling families out of low-wage jobs and into the middle class where they can then access the American Dream. Local Objectivism and a spirit of civic pride and accomplishment steadily increases and that leads to your area being almost, if not in fact, recession proof. What kind of impact did the last one of those have on your business and family? Yeah, me too. Currency starts to circulate when moneys changes hands, and buying local causes that to happen at a quicker pace. More money starts being spent by the local community and the "velocity" of money continues to increase. Because you're doing business with other local businesses "more money goes into input costs - supplies and upkeep, printing, advertising, paying employees - which puts money right back into the community," states David Morris, Vice President of the Institute for Local Self-Reliance. Diverting money away slows this once considered finite velocity and weakens the local, and even regional resilience of the economy. Buying from people you know, and thus knowing what you are getting - locally made products or support services you can trust actually reduce costs and build up the local job market. Remember, no matter what resources your local area has naturally, the biggest source of raw materials is always human beings. Buy local, and you'll be doing everyone a service! What other ways do you see that buying local or collaborating with trusted local companies helps your own business? Submit your comments by filling out the comment form below. For more information on Print or IT Services from Duplicated Business Solutions, just follow the link!